Varkala which is a small green town at a distance of nearly 50 km from Trivandrum is one of the major tourist spots in Kerala. 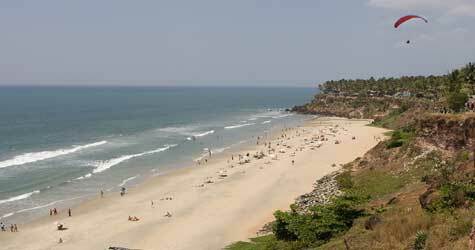 Varkala tourism has a rare capability to please every category of tourists. Bordered by golden sands and blossoming green plantations, the beach has a lot to offer. Varkala beach here is not just a tourist location availing facilities to sunbath, boat riding, swimming, adventure sports and ayurvedic treatments. The place is mainly famous as a religious place for the Hindu community. The beach is also known as papanasham beach and it is believed that taking a holy dip here cleanses away all your sins. 'Pappanasham' in local language means 'destruction of sins'. The beauty of dusk and dawn can be viewed easily from here and the place is peppered with flea markets and small shops. Certain sections of this beach are used by local people here to scatter the mortal remains. They believe that by doing so the soul of deceased will reach heaven. Janardhana Swami Temple which lies in the direction of Varkala beach is a famous religious site here. This holy shrine is believed to be constructed nearly 2000 years ago. An interesting mythology is behind the construction of this temple. According to this, the Janardhana Swami Temple was built by a Pandyan ruler after Lord Brahma forgave a sin committed by him. Once Lord Brahma through a dream told the King about the idol and its location which was submerged in the sea. He then with the help of some fishermen took out the deity and thus the temple was formed. As per studies done by historians, the original shrine was demolished by the tidal waves and later on it was rebuilt. Another renowned temple here is the Sarkara Devi Temple. Besides the religious and cultural importance, the kaliyoot festival held here is the core attraction of this temple. Sree Saraswaty Devi Temple popularly referred as Vidya Devi Temple is yet another famous temple here which can be visited at its full grace in festive seasons of Vijayadashami vidyarambham and Navaraatri Sangeetolsavam. Shivagiri Mutt which is a highly popular ashram in South India is also situated here. The great social reformer and philosopher Sree Narayana Guru established this ashram. Both the tomb and 'samadhi' of the founder can be found here and thus drags a lot of people to the place. It was in 1904 when the ashram was constructed and the spiritual Guru resided here until 1928. Today the premises of this site also serve as the headquarters for Sree Narayana Dharma Sangam. This ashram which is located top to the Shivagiri Hill is visited by the pilgrims mainly from December 30th to January 1st as the annual festival here is held during this time. The mutt is also popular as the local people organize various programs including cultural shows, seminars, community feasts, public meetings, debates etc. here. Even though the place is mainly visited by pilgrims, tourists from all around the world love to be here where such a great personality lived. Many people stay in Varkala beach hotels or any nearby resorts to attend the festivals here which may last for a few days. Anjengo Fort is a prime attraction of Varkala and this whispers many momentous events connected with the colonial rule here in this region. It is believed that the fort was constructed somewhere between the 17th and 18th century. The fort is presently in its ruins but effectively reflects the fact that the fort had been invaded by many outsiders for establishing themselves in Kerala. The British used this land for carrying out various trading activities. Another main attraction of the place is Kappil Lake which is located 8 km away from Varkala towards the north direction. The Lake provides picturesque views of dense green coconut grooves and the backwater which unites with the magnificent Arabian Sea which is a visual extravagance to anyone. You can get a better view of the place from the bridge built over this Lake. There is also a boat club here from where you can hire motor or pedal boats. But take care to ensure your safety by following the instructions provided to you from the concerned. Kappil Beach is yet another attraction near this lake. With remarkable hillocks and thick rocks, this beach is a long stretch of land bordering the sea. Tourists who visit this beach can also consider visiting Vettekkada beach which is also a stunning beach. Varkala Tunnel or Varkala Turuthu is an important historical site in this region. The British constructed this tunnel to establish a waterway for trading purposes. Nearly 14 years were taken to complete the construction of this long tunnel. The tunnel showcases architectural skills and creativity of the engineers and workers of that period. Another prime shrine in Varkala is the Kaduvayyil Juma Masjid which is also known as Kaduvayil Palli. This is dedicated to the Muslim saint, Kaduvayil Thangal and the place is regarded as one of the significant Sunni pilgrimage centres. Not only local Muslims but many devotees belonging to other beliefs visit this place. Varkala Lighthouse is one among the ideal spots from which you can get the complete view of the surroundings. If you want to enjoy the uninterrupted beauty of this place, this is a must visit place for you. The lighthouse constructed by the British in 18th century is a historic building which depicts the colonial style of architecture. In Varkala there is an island called Ponnumthuruthu which has a lovely atmosphere and boat rides. The island is surrounded by Arabian Sea and Angjeno backwaters. Here you will see an ancient temple of lord Shiva which is believed to be 100 years old. You can reach here easily by boat services from Varkala. 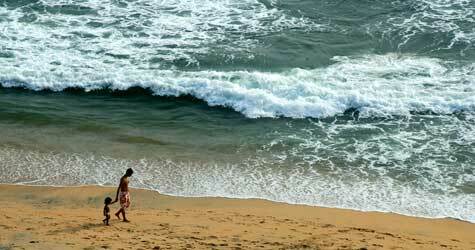 The climatic condition of Varkala is a great factor helping the tourism to flourish here. If you want to Visit Varkala, the best time for it is the winter season which starts in December and lasts till March. This time of the year is pleasant and colder with an average temperature of 25 degree Celsius. The months from March to May which are really hot and humid is followed by Monsoon. From June till December, Varkala is wet with heavy rainfall and the roads may not be in good condition. Winter is the perfect time to visit Varkala as the heavy monsoon which precedes winter makes Varkala vibrant and green thus enhancing its charm. You need not have to be worried about the stay in Varkala as there are resorts and cheaper homestays available in plenty.Adequate transportation facilities are available to Varkala and so you can easily reach there. 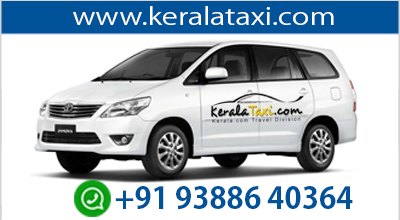 The nearest airport is at Trivandrum which is 36 Km away from Varkala. Thiruvanthapuram Airport which is well connected domestically and internationally has flights operating to and from almost all around the globe. As Varkala Railway Station doesn't have a huge train network, the better thing to do is boarding a train to Trivandrum. From both the airport and railway station, there are enough buses, taxis and auto-rickshaws. You may even hire two wheelers by providing a valid license for driving and some valid document as a security.